Leave out the cheese if you want to reduce the fat content in this hearty, yet romantic dish. Make the onion marmalade. Heat the oil and butter in a frying pan over a medium-low heat and add the red onions. Cook gently for 10-15 minutes, stirring occasionally, until very soft and starting to caramelise. Add the sugar, balsamic vinegar and seasoning and cook for a further 10 minutes, again stirring from time to time. Place the spinach in a large saucepan with just 3 tbsp of water, cover and cook over a medium heat for 6-8 minutes until the spinach starts to wilt. Stir in the butter and nutmeg and season with salt and pepper. Drain well. Heat a griddle pan over a high heat, brush with 1 tbsp olive oil, and griddle the steaks for 10-12 minutes on each side, depending on how well done you like your steak. Alternatively, cook the steaks under a hot grill. 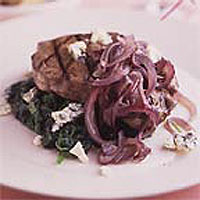 Divide the spinach between two plates, top with the steak and onion marmalade then scatter with cheese and serve.